This guest post is by Danielle Hughes, who runs a branding, marketing, and copywriting agency for businesses and solopreneurs that counts many major American corporations as its clients. She earned her BFA in Advertising and Graphic Communication from Washington University in St. Louis, but realized she was a much better writer than a designer. Danielle lives in Forest Hills, NY, with her 13-year old son. This post first appeared on the Amazing Community blog. I’m not a vain person. Yes, I take care of myself and I like to look good, but I’m pretty low maintenance as a “typical” (stereotypical) woman. I go out most days with unwashed hair and no makeup. I can often be seen donning one of many baseball caps. My go-to outfit is workout clothes or joggers and sneakers. That said, I do like to wear makeup. I do get dressed up and I can accessorize like no one’s business. 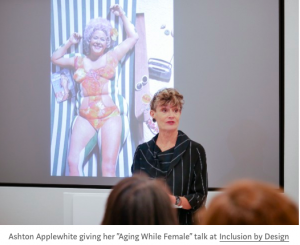 At Amazing Community’s Inclusion by Design conference on October 24, the dynamicanti-ageism activist Ashton Applewhite gave a talk entitled, “Aging While Female.”And frankly I hate her now. Ok, not really, but I have always prided myself on the above. On these comparisons. I loved telling people my age and have their jaw drop. I thrived knowing that I was not your typical 46-year old, whatever that means. And Ashton has taken that away from me…but with good reason. Because her impassioned keynote demonstrated to me, that by boosting myself up, I had to also be tearing others down. That this myth of beauty and youthfulness was perpetuated by society and mostly, let’s be honest, by white men, to keep women fearful. To keep women in line and desperate for attention and validation. Because if you are so focused on looking good, you can’t possibly notice that opportunities are being denied to you, that you are being held back and that you and other minority groups are being persecuted. Heavy stuff, but it was like a gut-punch. The glory hound in me wanted to say “screw you, Ashton,” let me have my youthful looks and energetic spirit. Let me revel in being told I look 35. Let me gloat in how good I look for my age. But that’s just it. What do people my age look like? They look like, well, whatever they look like. There’s no barometer or benchmark. You can’t look good or bad for your age, because you are simply you. That is how you look. It’s not a competition, though society certainly wants us to think it is. Without competition, the beauty industry wouldn’t be a $445 billion industry that preys on insecurity. All that money spent to look good, to look young to preserve youth. And, for what? Would we do this if we weren’t told to from a young age? If we grew up without media, would we be buying countless creams, lotions and products to keep our skin supple and wrinkle-free? Would the idea of dying our hair even cross our minds? Would the idea of injecting a disease into our face to smooth out lines?! I’m not saying you shouldn’t want to look good. I still plan to work out (for my health and my physical ability as I age), wear makeup and color my hair, but we need to redefine what “looking good” means. And more importantly, we need to be ok with the fact that what one person does, shouldn’t affect what another does and there is no wrong or right way to age. No judgment. If you want to color your hair, great. If you don’t, great. So long as you are doing it for you, and not for validation and not because society makes you think you have to. We, as women, need to stop defining ourselves by our appearance. We are so much more than that. We are smart and industrious and talented and creative and passionate and strong and just simply amazing. As we recognize this and support each other more, while belittling each other less, we can even the playing field and recognize the true beauty in every woman at every age. 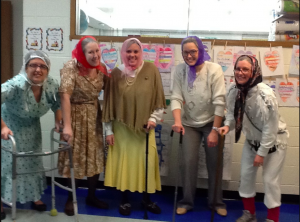 The 100th day of school used to be an opportunity to teach kindergarteners about the number 100. 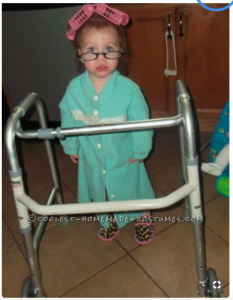 Somehow it morphed into kids dressing up like imaginary centenarians with mini-walkers and tiny canes—an event that reinforces ageist stereotypes. We’d like to turn it into one that educates little kids about late life, and nips ageism in the bud. Whether you’re a parent, grandparent, teacher, or advocate, this post explains how to join the movement against ageism’s first nationwide direction action. You’ll find some great suggestions in the comments on this Changing Aging post. Feel free to use and disseminate this image, the work of artist Celeste Fichter. (For a high-res version, contact her at thischairrocksassistant@gmail.com.) And here’s a link to a GIF that shows a jar of pennies filling up–great for sharing on social media. Not boring! Find out how the global movement to end ageism is gathering steam, and see which Resources We Love this month. Sign up for updates, and please use the submission form to send new resources our way. Old School will only reach its potential with input from teachers, writers, scholars, and advocates around the world. With your help, in other words. A reminder: to qualify, the resource has to focus explicitly on ageism–not on positive aging or productive aging or healthy aging or conscious aging or creative aging. Old School can’t be all things to all people, its purpose is narrow: to educate people about ageism and help dismantle it. Movements need people. (That would be you). Movements need purpose (To make the world a better place in which to grow old. And, while we’re at it, to be young, or have a disability, or be queer or non-rich or non-white.) And movements need tools. 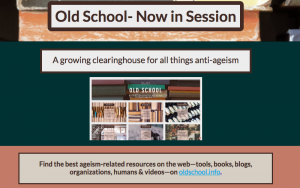 That’s why, in collaboration with age activists Kyrie Carpenter and Ryan Backer, I’ve launched Old School, a clearinghouse of free, vetted, anti-ageism resources: books and blogs, workshops and PowerPoints, organizations and advocates. Spread the word. Follow Old School on social media–on Twitter, on Facebook, and on Instagram–tell the world about it, and help it grow. Send us stuff. If you have an ageism-related resource — not about positive aging or productive aging or conscious aging or healthy aging, or creative aging – but explicitly focused on ageism — submit it to Old School using our online form. You name the resource, you own it, you link it to your organization or services; we make it available for free. We built Old School to educate people about ageism and help dismantle it though individual and collective political action. It’s an ongoing collaboration, and will only realize its potential with help from people like you and organizations like yours. We hope you’ll like it, use it, and help it grow. Most Americans aren’t optimistic about getting older, and think the source of the problem is aging itself. So do most policy wonks, framing population aging as a set of choices about how to care for an avalanche of “frail and needy elderly.” MIT’s Joseph F. Coughlin and I don’t share that myopia. His latest book, The Longevity Economy, is packed with big ideas about the “dramatic-yet-predictable” effects of the new longevity, which we think presents a remarkable opportunity to build a better old age. We also know that what stands between us and this brighter future is the culture itself. But he’s putting his faith in corporations to “do the right thing” while I envision a very different engine of change. Coughlin founded the MIT AgeLab, which “applies consumer-centered systems . . . to catalyze innovation across business markets,” so it’s not surprising that his approach to the longevity boom is market-driven. “It’s as though a whole new continent were rising out of the sea, filled with more than a billion air-breathing consumers just begging for products that fulfill their demands,” he writes. Soon, he predicts, “the world’s most advanced economies will evolve around the needs, wants, and whims of grandparents.” The products and technologies that emerge to meet those needs won’t just be highly profitable. By improving the quality of life of older Americans in countless yet-to-be-imagined ways, the book predicts, they will enlarge and enrich the way we experience old age itself. It’s a bold proposition, and it’s also misguided. 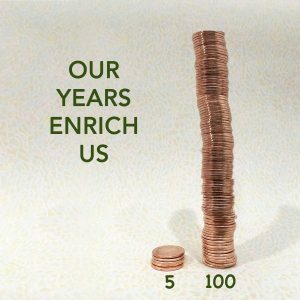 What stands between us and this better old age? Why are companies failing to “wake up, smell the Ensure”—which, Coughlin points out, is pretty much Soylent marketed to olders—and start courting older consumers with all the fervor they currently lavish on millennials?” Because of “our very idea of old age [emphasis mine], which is socially constructed, historically contingent and deeply flawed.” “Socially constructed,” as I often say, is sociology-speak for “we make it up,” and we’re in synch when Coughlin declares “Old age is made up” [emphasis his]. Not made up like a fun game, made up like a shared delusion. Call it a “collective case of blindness” as Coughlin does. Call it “implicit bias—prejudice so deeply ingrained that you might not even know you harbor it—against older people is the norm across age groups,” as he also describes it. Call it “ageism,” as I do, and why Coughlin fails to is beyond me; the word barely appears in The Longevity Economy. But although our approaches differ, we agree on the heart of the problem: an ageist culture that confines olders to the margins of society and sanctions only the blandest of “age appropriate” behaviors: relaxing, volunteering, grandparenting, and falling apart. Who’s going to drive the necessary social change? Not olders themselves, Coughlin writes, “because their ability to picture new, better ways to live is utterly constrained by our current, pernicious narrative.” The drivers, he says, will be the corporate visionaries who understand that olders aspire to the same stuff as everyone else does—work, romance, purpose, imagine that!—and create the products that enable those aspirations. “By building a vision of late life that is more than just a miserable version of middle age, companies won’t just be minting money . . . they’ll also be creating a cultural environment that values the contributions of older adults.” The result will create a virtuous circle: by enriching and enlarging our vision of late life, better products will bring it about. I love Coughlin’s vision of “a new narrative of possibility in old age,” but I don’t think it’s going to emerge from the business community. Corporations can speed social change, and they can definitely commodify it, turning sisterhood into grrl power into the Spice Girls, for example. But they exist to profit, not provoke, and it’s easy to monetize fear and insecurity. Who says wrinkles are ugly? The multi-billion-dollar anti-aging skincare industry. Who says perimenopause and “low T” and mild cognitive impairment are medical conditions? The trillion-dollar pharmaceutical industry. Why would corporations be instrumental in overturning prejudices from which they profit on this scale? A consumer revolution requires a social revolution. We know that as time grows shorter, purpose becomes an ever-higher priority. As Coughlin observes, “Culture helps determine what older people find meaningful. And that raises a question: can . . . new, socially permissible routes to meaning open up?” Of course they can: look at the effect of the women’s movement on women’s lives around the world! Whether global or local, whether revolutionary or reactionary, social movements challenge our notion of what’s “normal,” equitable, and possible, and in the process transform society. The technology- and consumption-driven revolution described in The Longevity Economy cannot take place without a mass movement to raise awareness of ageism and to end it. Those “perception barriers” are based on fear and shame, the grotesque notion that to age is to fail. We’re going to stay mired in age shame until we take off our collective blinders and acknowledge, out loud and together, what we know to be true: that age enriches us. We’re not going to put these fears in perspective—to acknowledge, for example, that aging well and living with disability can and do coexist—without a shift in cultural values. That won’t happen without mass political action that provokes society-wide upheaval, because the dominant culture will push back hard, as it does against anything that threatens the status quo. A shift in consumer behavior isn’t going to do it. We need people in the streets, not waiting for the free market to rescue us or carry the ball. Change begins with consciousness-raising, the tool that catalyzed the women’s movement. (Here’s a link to Who Me, Ageist? A Guide to Starting A Consciousness-Raising Group.) Women came together in the 1970s, compared stories, and realized that the obstacles they were facing—not getting heard, or hired, or respected—weren’t personal misfortunes but widely shared political problems that required collective action. Social change occurs only as we take that awareness out into the world and directly and explicitly confront the ageism that diminishes and segregates older Americans in every arena. “The new, bespoke narrative of old age will emerge organically from our jobs as consumers. It will fit like a tailored suit,” Coughlin writes. Corporations are indeed going to do well by those of us who can afford tailors. There will be robots to hoist and help us, lovely communities to shield us from isolation, implants to enhance our senses (thank you, brand new cornea)—but only for those of us who can afford them. We can’t achieve equity without addressing the ways in which age intersects with race, class and gender. The movement needs to be much broader in order to bring about the richer and better old age that we all hope to lives long enough to enjoy. Who gets this better old age? Coughlin does acknowledge, almost in passing, that “we’re staring at a possible future in which the gift of extra years of life is diverted straight to the wealthiest people in the world,” Possible? In a historic and shameful reversal, lifespans in the U.S. are in decline, largely among poor white women. A 2017 report by the United Nations found growing numbers of Americans living in extreme poverty. The engine of that disparity is unfettered capitalism. The modern welfare state was born in response to that disparity, lifting millions out of poverty in the wake of the Great Depression. That safety net has since been shrunk, and all the cuts that late-stage capitalism requires in order to stay viable, including the current tax bill, promise to shred it further. Capitalism is at best indifferent to the welfare of vulnerable populations, and more typically hostile to it. Pitting “disposable workers” against each other keeps salaries low, and the less economically productive people at both ends of the age spectrum are especially at risk. Gender disadvantages. Companies continue to pay women less than men and promote them less often, because it helps the bottom line and because they can still get away with it. Racism and homophobia also enter in. Older workers of color are most at risk for unemployment, with older African American men twice as likely to be unemployed as older white men, and LBGT olders fare even worse. Corporations are no more going to fix ageism than they’re going to fix racism or sexism. Closing the inequality gap and moving towards age equity means “changing the fundamental rules of old age,” Coughlin writes. I couldn’t agree more, and technology and innovation will indeed help older Americans stay healthy and connected. But at best his proposal is a subset of the solution. At worst it’s a band-aid on the gaping wound of deep economic inequality and a dangerous distraction from the radical action necessary to catalyze real social change. A better life for older people means valuing human beings lifelong, independent of their ability to consume or produce. That’s a better world for everyone, only a grassroots social movement will bring it about, and it is underway. This guest post is by Ruth Ginzberg, 65, the Sr. I.T. Procurement Specialist at the University of Wisconsin System. She has an allegedly useless humanities degree in Philosophy with a concentration in Ethics, and an advanced technical degree in Information Systems Security. I keep trying to figure out why so many articles about older workers as valuable resources, and older individuals outside of work as valuable members of the community, still make me grouchy. I think it’s because they still promote stereotypes, just perhaps slightly more positive stereotypes than those that depict us as all in the throes of decline, disability, dementia and death. The wise, kindly, nurturing grandmotherly and grandfatherly stereotypes often featured in such pieces may describe some older individuals, but let’s not forget that many older individuals don’t fit, and don’t want to fit, into those kinds of roles in their workplaces or communities either. Not all older workers are repositories of “institutional memory.” Some older workers have only worked for their current employers for several years themselves, and are still learning the business (and in need of as much training, mentoring and professional development as are younger workers with only a few years in their current roles). Some older individuals are more comfortable analyzing, synthesizing, designing, engineering, building, and testing solutions to tricky problems than they are reading children’s books to toddlers or gardening with middle schoolers. Some older individuals have talents they’ve not yet had the time or energy to develop, and cherish the opportunity to develop them later in life. Some older individuals discover talents they never knew they had before. Most older individuals probably don’t want to play the role of stereotypical characters in somebody else’s script. Even stereotypes that on the surface appear to be positive often are not. They still pigeonhole multi-dimensional human beings by reducing them to one-dimensional caricatures The problem is that the invoked stereotype, viewed close up, interferes with the ability to see older individuals’ many other talents and skills. This guest post is by Louise Pendry, a Senior Lecturer in Psychology at the University of Exeter in the UK. She’s delighted to be combining her work on online communities, stereotyping and prejudice, with her long-standing personal interest in and (more recently) her lived experience of women and ageing. Currently she is exploring how online communities can help support and empower women as they grow older. You can reach her at l.f.pendry@exeter.ac.uk or find her on Instagram as silverserenity4. I like to think I’ve got a pretty good attitude to growing older. I’m genuinely enjoying my life post-50. But recently, I hit a roadblock to my progress here, and that roadblock is me, or more precisely, how I sometimes think about me. That’s what I want to share with you. As a psychology lecturer, I teach a class on stereotyping. Mostly I focus on how we stereotype other people, but lately I’ve started to look at what happens when we stereotype ourselves, especially when we do so on the basis of age (internalised ageism). I like to start each class with concrete examples of the topic I want to tell my students about to make it real. This is easy when it comes to stereotyping other groups (e.g., black males shot in error by police). But this SELF-stereotyping angle was less obvious. I was struggling to find a vivid, relevant illustration. Little did I realise that I’d do something – actually in the class itself – that would give my students a perfect real-life example. Here’s what happened. It was the week before my planned session on age stereotyping. Part of the class involves students giving presentations on research articles. This is my cue to sit down and grade their efforts. The room layout was cramped and necessitated me clambering (tripping!) around the AV equipment, before climbing inelegantly over a desk to reach a seat. All of this was achieved with much stumbling and huffing and puffing on my part. Trying to make light of it, I smiled and said “Ha! I’m not the woman I was!” Cue much laughing. At the end of class, a student approached me about her presentation the following week, ironically on an article about age self-stereotyping. “You know, you just demonstrated what that article called ‘internalised ageism’,” she said. And she was right. I had used a common negative stereotype about ageing (declining physical fitness) to explain my behaviour and it was more than likely not justified. Actually anyone would have struggled to reach their seat in that classroom, young or old. Thinking this was just an aberrant moment on my part, I tried not to worry. But as I started to think about it, I realised this was not an isolated episode. I’ve certainly found myself joking about an unfortunate “senior moment” when I’ve mislaid my glasses and can’t recall where. Where’s the harm in that? We all do it, right? Really though, what I’m doing here when I make this kind of humorous self-deprecating remark is classifying a behaviour I’ve performed as proof that my memory’s going and furthermore, highlighting it’s because of a negative and enduring part of the elderly stereotype: forgetful. I’ve pigeonholed myself, written myself off. This memory lapse could be a sign of impending Alzheimers but it’s more likely to signify that my life is way too busy. It could happen to anyone AT ANY AGE if they had as much going on as I often do. Or it could be down to menopausal brain fog (annoying but not necessarily permanent). Minor deteriorations in cognitive function can certainly happen as we age, but that doesn’t mean every slight memory lapse is a sign of serious cognitive decline. Perhaps you think I’m over-reacting. You might think, “Good grief, where’s your sense of humour?” Now don’t get me wrong, I like a laugh as much as anyone. But here I think it might be an issue because such self-stereotyping can have important consequences for us. Research by Becca Levy and colleagues has shown that when we THINK of old as negative, we can start to FEEL old and may even ACT in a way that confirms negative elderly stereotypes. And that can basically hijack our best efforts to age positively. What does this mean? Well, translated into everyday life, it suggests that the unconscious age self-stereotypes we hold and express (“I left my phone in the fridge, I’m having yet another senior moment!”) affect how well we approach and perform associated tasks in future (“My memory is clearly ****ed. How will I ever remember everything on my to-do list today?”). We become our own self-fulfilling prophecy. Now I’m aware, I’m going to try to catch myself in the act when I do this, and maybe respond differently. It’s early days yet, but I would say I’m noticing this tendency more in myself and others. I met a friend for coffee recently and we were chatting about her job, and whether she wanted to apply for a new role with more responsibility. “I just don’t feel I’m mentally up to it any more,” she confessed, “I’m too old.” Mindful of all I’ve said above, I replied, “If you really don’t fancy it, that’s up to you. But if you do feel it’s not for you, is it down to your age? Remember, you moved jobs two years ago from one in which you had control over your daily routine to one which has you running around, at the beck and call of others. In your current role, you often feel overwhelmed, and that might be colouring your mindset, making you doubt your abilities. It might not be your age.” “Louise,” she replied, “you would never have said that before, you’d just have agreed with me.” And she’s right, I would have. I’m not saying there aren’t some downsides to growing older, simply that there may be many explanations for the things we do as we grow older that are not irrevocably tied to age. Pausing to reflect on these alternatives might allow us to reappraise our achievements and move forward with this phase of our lives more positively, be that bit more resilient. As Becca Levy says: “…as all humans age, they should be aware of their own implicit negative views of their group and consciously develop an identity with old age and its positive attributes, using these to compensate for the ill effects of automatic ageism.” Reader, I’m on it!